Some images from Jayel’s last livestream. Things have been rolling along at a steady yet escalating pace here at Oneshi Press! We are thrilled to report that we have already surpassed our first monthly goal at Patreon! With generous donations from fans, we have purchased two webcams. 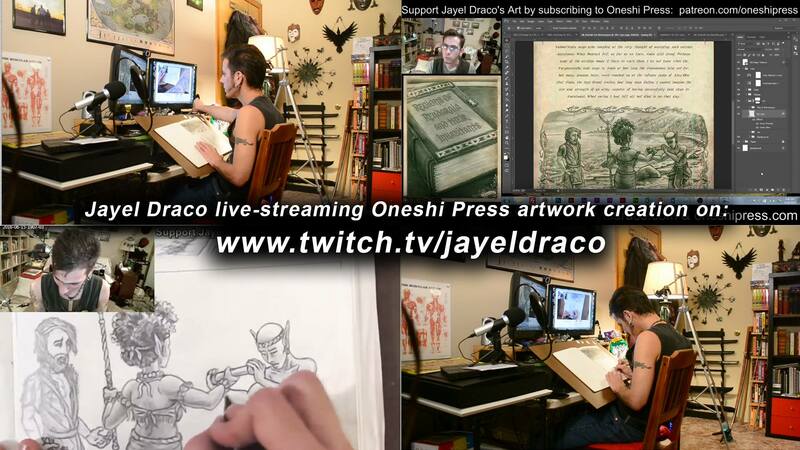 Our incredibly talented illustrator (and Oneshi co-founder) Jayel Draco will livestream his art-making process with those webcams tonight! This is a big moment for Oneshi Press. Tracy Queen is our largest current book project, and we’ve been working on it for a long time. Jayel has made concept art and sample art for it, as well as a gorgeous cover that’s already been released on our patrons-only Patreon feed. But tonight’s livestream will reveal the first page of the book itself–something we at Oneshi have been waiting to see happen for years! We can’t possibly thank our patrons enough for helping us get to this point. If you’d like to join the team, find out how at Patreon!